Winning football games in an entertaining fashion is the holy grail for football managers the world over. Given Hibs’ recent propensity for putting Neil Lennon and their supporters through the wringer, defender Paul Hanlon insists he would happily settle for an insipid goal-less draw in tonight’s Europa League clash with Asteras Tripolis. Scoring goals has not been a problem; Neil Lennon’s side have amassed 20 in their last four competitive outings, including three from last Thursday’s 3-2 second qualifying round first leg victory over the Greeks. 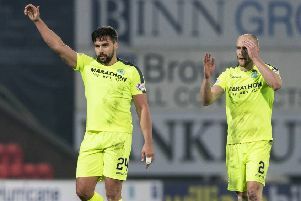 What is more alarming, particularly for Hanlon, is the ease in which the opposition have been able to breach the Hibs rearguard, with 12 having been conceded during the same period. A no-scoring encounter at the Theodoros Kolokotronis stadium this evening would propel the Leith outfit into the next round where they would most likely face Norwegian side Molde And as someone who prides himself on clean sheets, Hanlon admits substance overrides style in his book. “From a defender’s point of view, a 0-0 draw, boring with nothing happening would be ideal for me and that will get us through to the next round,” said the 28-year-old, who helped Neil Lennon’s side recover from a two-goal half-time deficit in the first match. “But whatever it takes to get us through, that’s all that matters. “Stopping goals is a team responsibility and the back line will take most of the blame for it but it’s something we need to tidy up as we’ve been conceding a few slack goals. “We’ll need to tidy that up and then I’m sure we will be in a much better position. “You never know we could end up 2-0 down early doors again and we have to do it all again. We’re going to their home patch now with a lead and I’m sure they will maybe change their gameplan a bit because they’ve got to score but we’ll be ready for whatever they throw at us. “I would say the tie is still evenly matched, a clean sheet and we’re through so that’s obviously a massive positive. Reaching the third qualifying round would take Hibs into uncharted territory in the modern era, with the club not having successfully negotiated successive European ties since Eddie Turnbull’s team reached the quarter-finals of the old UEFA Cup Winners’ Cup during the 1972/3 campaign. Hanlon, who celebrated his testimonial last year, insists writing a new chapter in Europe is not something he is considering. “It’s not about worrying about what happened in the past with previous records, it’s a chance to do as well as we can and we’ve put ourselves in a good position,” he added. Flo Kamberi capped a memorable night in the first leg with an injury-time winner after Efe Ambrose and David Gray drew Hibs level. Hanlon still vividly remembers the drama of the legendary AEK Athens match at Easter Road in 2001 when the Edinburgh club were narrowly beaten 4-3 after extra-time. In years to come, Hanlon believes the opening victory over Tripolis will go down in the club’s folklore. He added: “The main European game I can remember growing up as a fan was going to the Athens game, when there was an unbelievable atmosphere at Easter Road. “We came so close to going through and I’m sure a lot of fans remember that match as a massive game in Hibs’ European history. “I was maybe ten at the time but I remember it quite clearly. “I think last Thursday’s one was a good one as well, our fans seemed to enjoy it and it was a good entertaining game and I’m glad we came out on top. “Fans will probably look back on it as being a memorable one, the way we came back. There were good goals in the game and it was both teams attacking and it was a good football match. It had a bit of everything, a sending off as well. On a personal level, Hanlon also relishes the challenges and glamour associated with European football. He added: “I’ve been at Hibs ten years now and played teams so many teams so it’s something different; different cultures, stadia and I’m just desperate to do well because the further you go, the better places you go to and you’ll come up against better teams. Molde, managed by Ole Gunnar Solskjaer who are expected to see off Albania side KF Laçi, would represent another test but Hanlon is not looking past Tripolis.